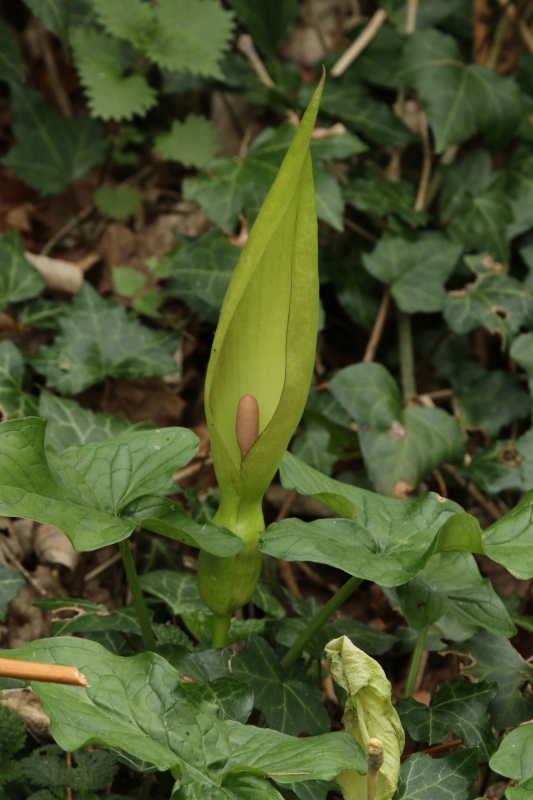 Lords and Ladies, Wild Arum and Cuckoo Pint are some of it’s common names but it is Arum maculatum and it flowers in April, so here it is. It is not the most beautiful flower in the world but it is quite large and it is very interesting. The leaves of this plant appear quite early in Spring, normally around the end of February. It is a plant of the hedgerows and the edges of woodland. It likes some shade but not too much. 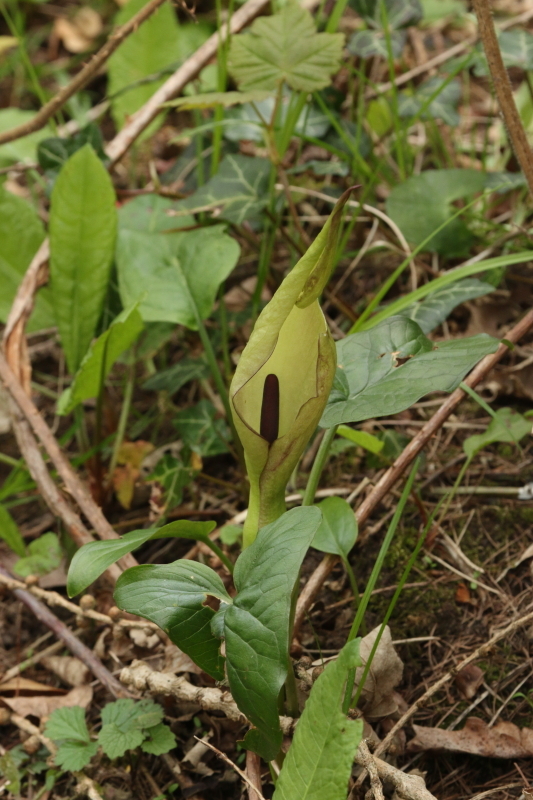 The leaves are large and arrow shaped and sometimes have dark purple coloured blotches on them. Then in April up pops the flower which is not like any normal flower- it is a curled up spike which narrows at the base and then becomes swollen before the stalk disappears into the ground. This peculiar rolled up pointed protuberance is called a spathe and it can vary in colour from pale yellow through to various shades of green and can even be a purple colour. This spathe will eventually unroll to reveal a club-shaped central spike which is called a spadix and these too vary in colour from dark purple as in the photo through to lemon yellow. The spadix produces a smell of ammonia and amines, ie a bit like urine, which attracts little flies. From here on in it all gets a bit complicated so I think a diagram of the flower (and remember that this is a flower although it is not much like your normal daisy or daffodil) is in order. It is the little flies which are the all important part of this story. Having been attracted to the smelly spadix they are funneled down towards the swollen base of the flower. This process is aided by the shape of the spathe and it’s slippery surface. Where the spathe narrows before the swollen lower part there is a ring of little hairs and these point downwards which allows the flies to squeeze past them but stops them getting back out. Now before I go on it is important to point out that these flies will have previously visited another Arum flower and will be covered with pollen. How this has happened will become apparent in a short while. So now we have flies covered with pollen from another plant which have now got past the hairs and are stuck in this swollen chamber at the base of the spathe. In this chamber are the female flowers which are the ovules which are at this stage receptive to pollen and so the flies will inadvertently deposit pollen on the ovules and thus the female flowers will be pollinated by pollen from another flower. Are you following all this? Good; now once the female flowers are pollinated this triggers the male flowers into action and the anthers burst open exposing their pollen and the poor little flies now get a fresh covering of pollen. By this stage the ovules which were pollinated a few days ago are no longer receptive and so will not be pollinated by their own pollen. Now the final piece in the jig saw. Once the flies have got a new coating of pollen the hairs at the top which they earlier squeezed past now wither up and die so the flies can escape from their little prison and go on their way to the next flower and repeat the whole process. Isn’t nature clever?! 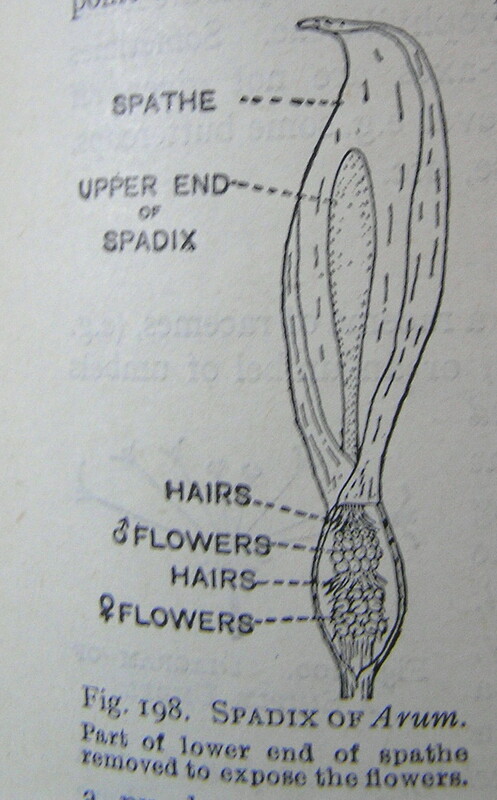 The diagram was taken from a book called Textbook of Botany by Lowson. If you are quite old and did ‘A’ level Botany or Biology it will be like an old friend. 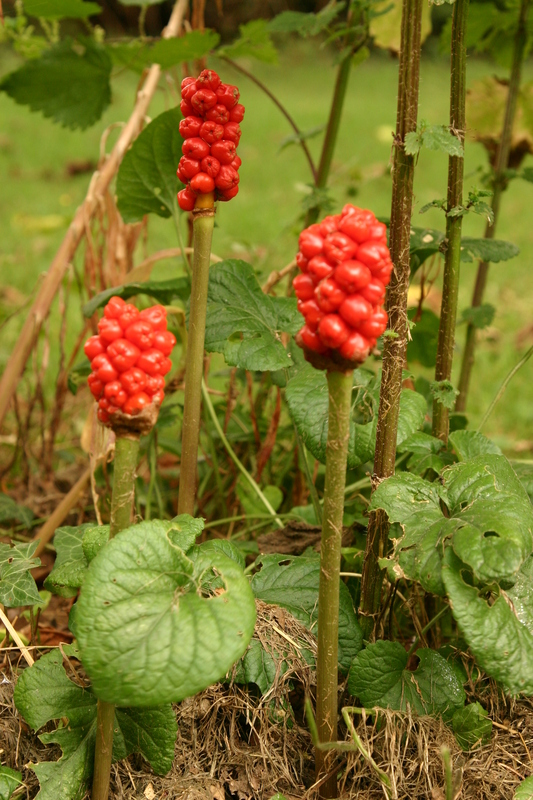 If this rather complicated system to ensure cross pollination works out then the ovules develop and the spathe and spadix dissapear and in the autumn you are left with a spike of red berries, that look attractive but which I believe are poisonous.